Tsumugi Takanashi is the new manager at an entertainment agency. Her new role? 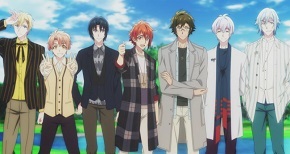 Managing seven boys in a new idol group! She sets out to meet her new assignment. On 6th August 2014, at 1 PM, my two favourite pastimes are going to be at one place. Brandon Sanderson + Waterstones = Bliss. The tour is to promote and sign copies of, Words of Radiance: The Stormlight Archive Book Two , Brandon Sanderson will be going to various locations across the UK. Most importantly, he will be coming to Leeds, which is my local bookstore. Words of Radiance is a sequel to the stunningly epic The Way of Kings, which was so epic that it had to split into Part One and Part Two . That was the main reason that I hadn’t picked up Words of Radiance yet, seeing that the hardback book resembled a brick (over a 1000 pages!). That doesn’t matter! I will pick up the brick at the store, and get it signed, and also stare at my favourite author like a total creep. I’m allowed to do that (I think). I actually had the opportunity to see Brandon Sanderson in Manchester when the initial UK tour for The Way of Kings was on, IF I skipped a lecture at Uni and travelled down. I ended up not skipping that lecture, and really regretted it. This time, I suppose I shall fangirl twice as much. Brandon Sanderson will be visiting London, Liverpool, Manchester, Leeds, and Nottingham. See the rest of the UK dates here.